8 Vegetables That Are Better to Eat Raw | "Global Possibilities"
Cooking vegetables can often bring out their health benefits, but to maximize the cancer-fighting potential of some of them, raw is the better way to go. It should be noted that people with goiter or hypothyroidism must limit their intake of cruciferous vegetables, which are goitrogenic; i.e., they induce the formation of goiter through enzymes that interfere with iodine uptake. And as with most things, too much glucosinolate can be hazardous, particularly for people who are seriously ill. Always check with your doctor about any dietary changes. But for people who have no problem eating crucifers, these unique vegetables should be a part of a healthy diet, especially considering the fact that there is a growing body evidence that they are effective at protecting against cancer. According to the National Institutes of Health, isothiocyanates can help prevent cancer by protecting cells from DNA damage, inactivating carcinogens, inducing cell death (apoptosis), inhibiting the formation of tumor blood vessel (angiogenesis) and migration of tumor cells (needed for metastasis) and causing antiviral, antibacterial and anti-inflammatory effects. A 1999 study by the Department of Public Health Sciences at the University of Toronto and a 2000 study by the Cancer Research Center at the University of Hawaii, both case-control studies, found that people who consumed greater amounts of cruciferous vegetables had a lower risk of prostate cancer. Women appear to benefit from cruciferous vegetables more than men. The Netherlands Cohort Study on Diet and Cancer (2000) found that women (but not men) who had a high intake of cruciferous vegetables had a reduced risk of colon cancer. A Harvard Medical School study, also from 2000, found that women who consumed more than five servings of cruciferous vegetables per week had a lower risk of lung cancer. One case-control study published in the Journal of the American Medical Association in 2001 found that women who ate greater amounts of cruciferous vegetables had a lower risk of breast cancer. 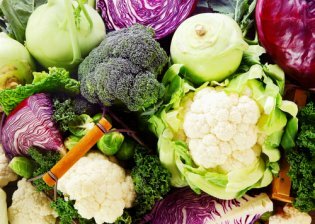 Here are eight of the most popular cruciferous vegetables that are best to eat raw to get the most out of their cancer-fighting power — and also to prevent their water-soluble vitamins from leaching out during the cooking process. But if you’ve got to add heat, less time is better and don’t let them touch water: a light steam will help keep more of their nutrients intact.